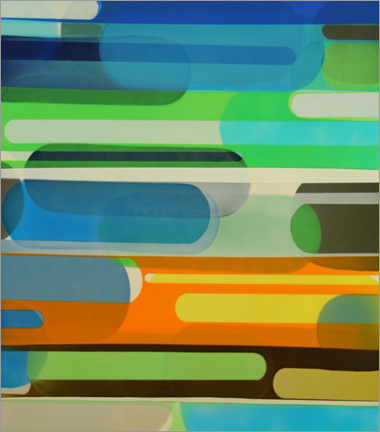 Susan Dory creates abstract compositions from the repetition of translucent forms, shapes and bold colors. Her layering process represents different memories and personal moments in time, relaying a collage of sentimental history for the viewer as well as the artist. Prices start at $3,000 for a 24"x18" painting and go up to approximately $14,000 for her largest work, which measures 72"x66". 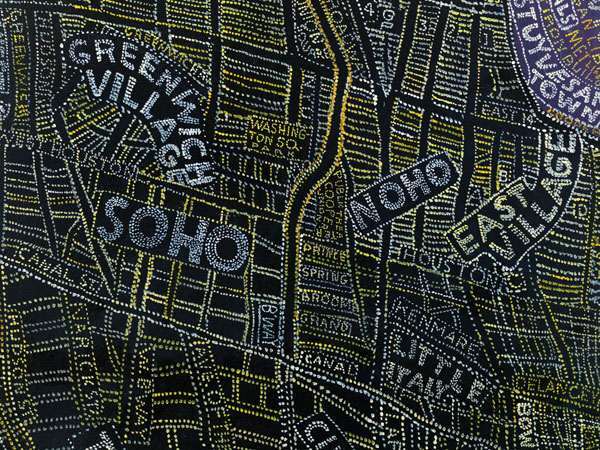 In the same spirit of the Pop artists of the 1960s, Paula Scher's hand-pulled screenprints of her highly-praised Map paintings are available in limited editions. Her dynamic images are filled with explosions of words, lines, bright colors, and a vast amount of information, such as population numbers, city names, roads, and bus routes. Each print measures approximately 60"x40" and is printed on deluxe Lana Quarelle paper. 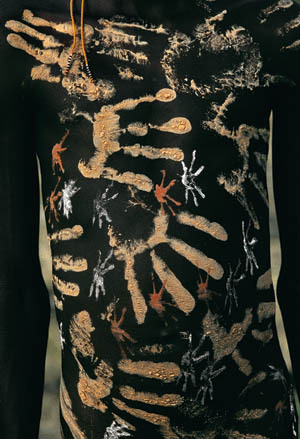 The artist has signed, dated and numbered each one, which sell for about $5,000 each. Available images include China, Europe, NYC Transit, Manhattan at night, Africa and the United States. India to be released in February 2009. Originally from Colombia, South America, Yvonne Estrada currently lives and works in Brooklyn, New York. She has been inspired by nature, her subconscious, and memory to create these small gems. 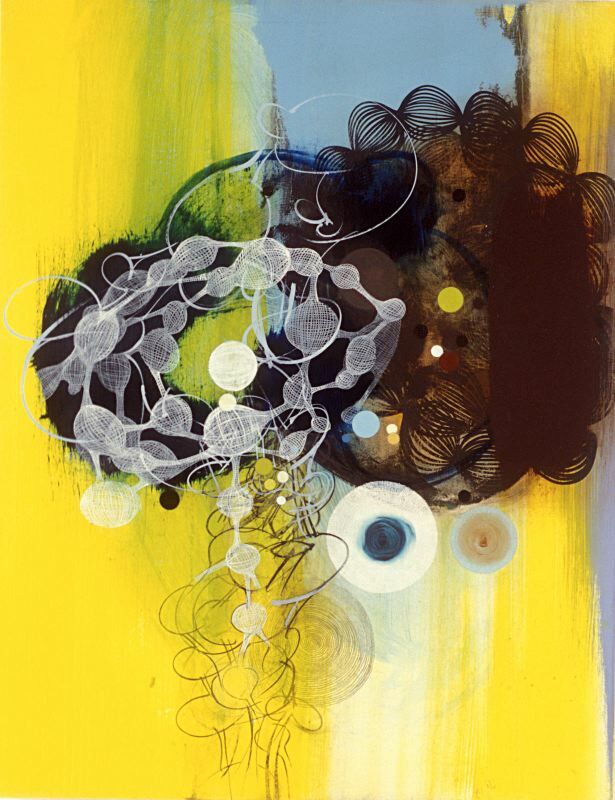 Using jewel-like colors Estrada incorporates drawing, geometry, and various patterns in her work, weaving and overlapping her applications of drips and stains to create a delicate complexity. These paintings all measure 18"x14" and sell for approximately $6,000. Estrada has also produced incredibly elaborate ball-point pen drawings in the same vein that are priced under $9,000 measuring 3'x5'. James Richards is a Los Angeles-based artist. In his newest body of work, it is easy to see there is something more going on than just paint on a canvas. 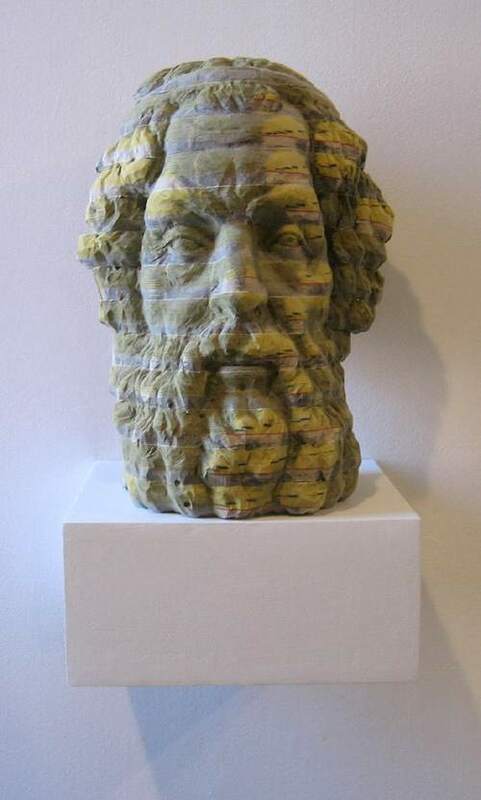 By using acrylic, nylon string, yarn and wood, his images not only exist on the surface but behind it as well in the form of shadows cast on the wall. Richards has created a new hybrid of painting by embracing an arts and crafts sensibility with sculptural, painterly and artistic elements. Prices start at $6,500 for a work measuring 36" x 41". 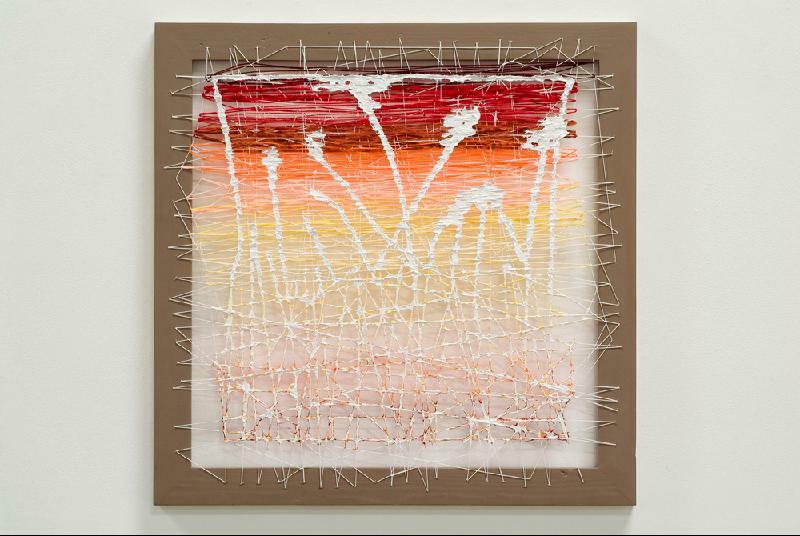 Michelle Forsyth's most recent works are a result of her investigation into color, texture and concept. By using a repetitive layering process, Forsyth creates an assemblage of cut paper, felt, beads, and foam held together with straight pins. She memorializes tragic events by siting a specific date, location or description of what happened. But what she actually portrays is a present-day documentation of the environment after the fact. In the work above, a tree with flowers is visible, marking a spot where a train carrying toxic chemicals derailed years ago. Prices for her work start at about $6,000. Fishbowl Histories is a new body of work by Jeremy Dickinson that continues his series of Civic Pride paintings, begun 15 years ago when he started depicting British city buses. 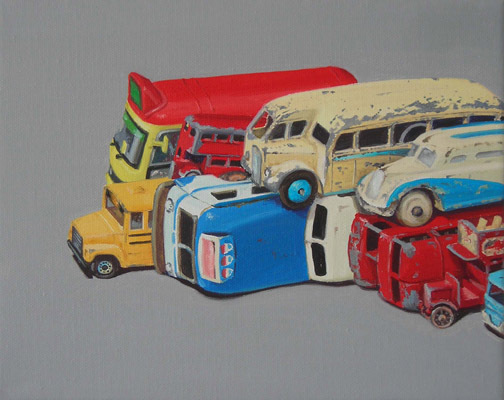 The main focus of this collection is Dickinson's 1960s die-cast Tootsietoy Greyhound Scenicruiser bus, which he features with other collector model cars, toy building blocks, Superballs and bus parts salvaged from junkyards. Dickinson arranges his various vehicles in stacks organized by color and, in this exhibition, by Top Ten English soccer teams. Works start at approximately $4,200 for a 10"x 12" oil painting and go up in price from there. Cecilia Biagini was born in Buenos Aires in 1967 but has lived and worked in Brooklyn, NY since 1998. 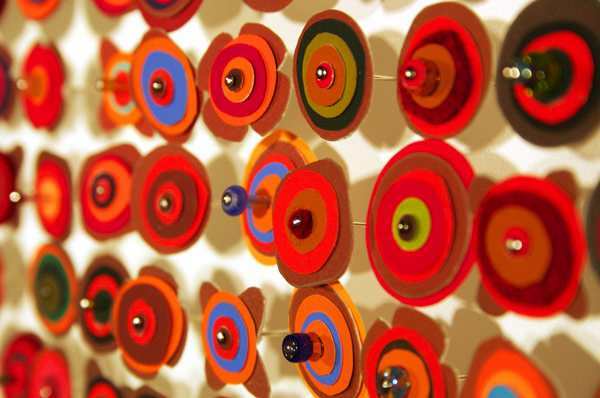 She explores and celebrates color, movement, and abstraction through wall sculpture, painting and photograms. 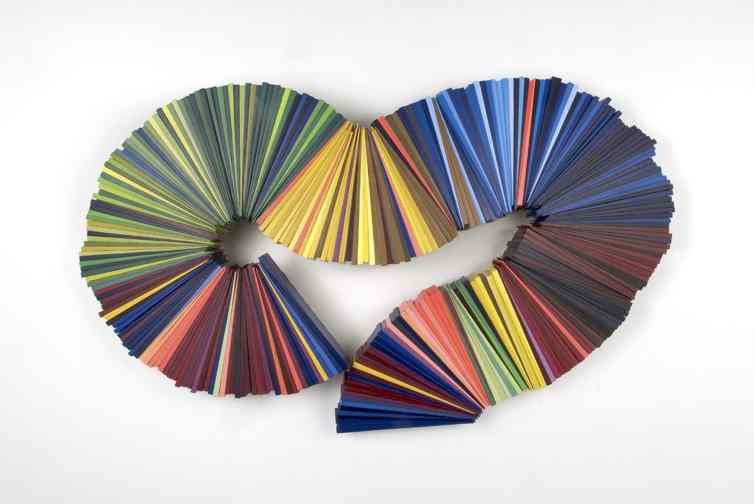 Primarily working with variations of line, her multiple layers of colored carpenter shingles build upon a depth of perception that camouflage into each other. 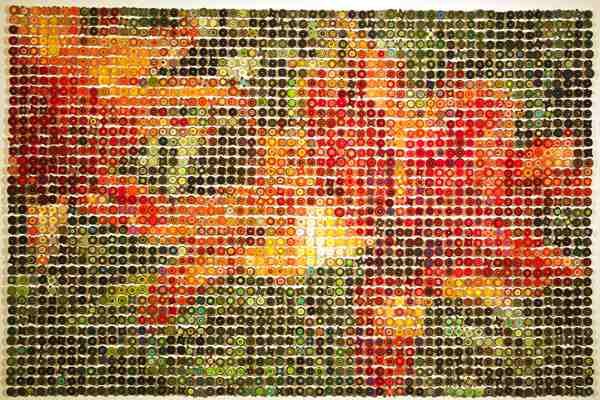 Prices start at $4,500 for the wall sculptures and approximately $8,500 for her works on canvas. 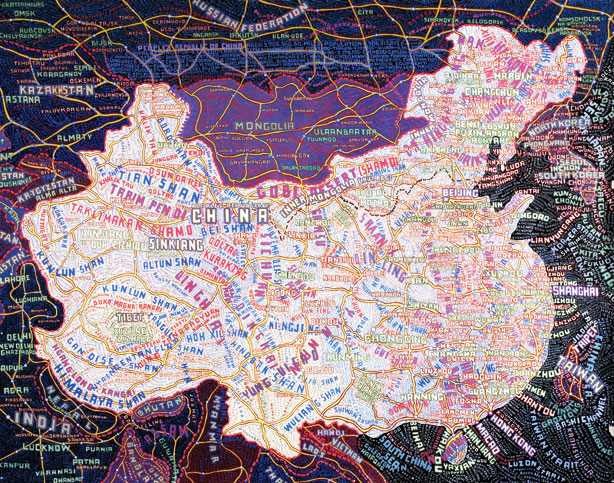 Long-Bin Chen has been known for working with phone books, catalogs, and magazines as his medium. 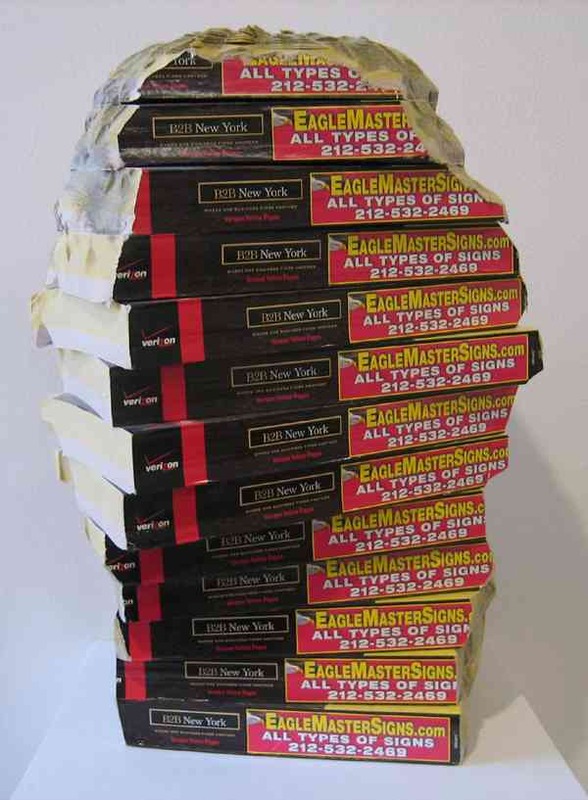 Using traditional sculpture techniques, he hand-carves the books into faces and Buddha heads, which remarkably resemble carved stone or marble. These tabletop carvings measure about 18" high and start at $9,000. The seemingly simple paintings by Jessica Rohrer act as a capsule for her own biography telling of the places she has lived and things she has seen. 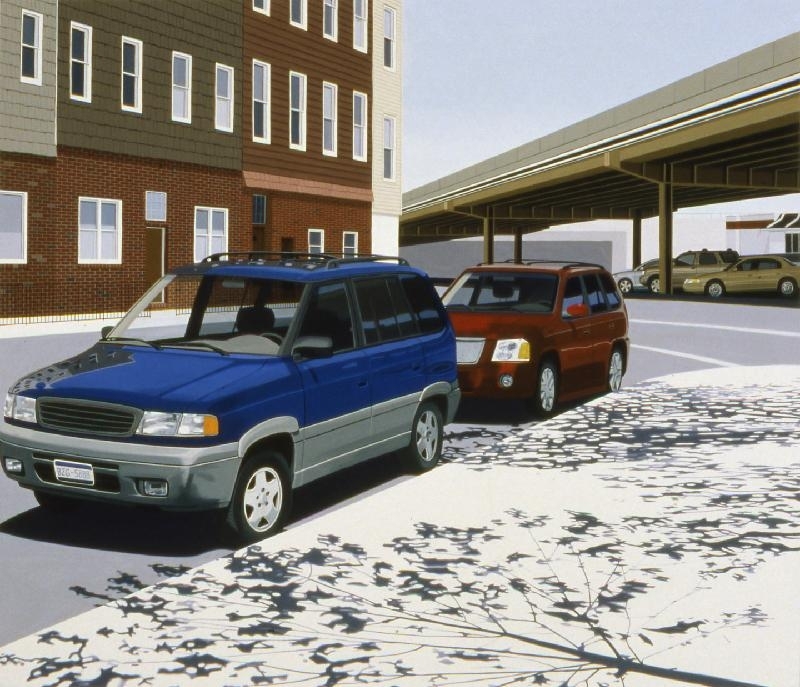 She both preserves and pays homage to the mundane elements of street corners, bridges and main thoroughfares literally recording the various cars, roads and nature in the neighborhoods she observes. Using photography, direct observation and memory, Rohrer produces photorealistic portraits of street life in her work. Her oils on panel start at $3,000 for a piece measuring 9"x15". Prices quoted are approximate retail prices that were current as of the time this newsletter went to press.